The Harmon College of Business and Professional Studies has received accreditation by the Association to Advance Collegiate Schools of Business, an accreditation given to less than one-third of the nation’s business schools. You will earn a degree from an accredited program, and you will benefit from the school’s 90 per cent job placement rate and extensive on-campus recruitment program. A wide variety of scholarships are available to help finance your education. 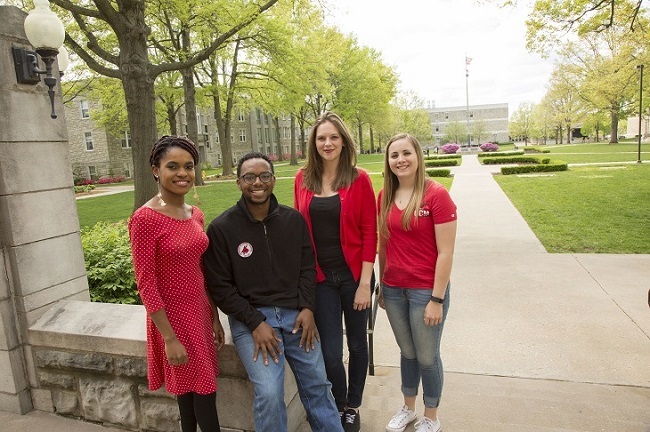 Learn more about the scholarships available at ucmo.edu/efascholar. Every UCM student is eligible for a $1,000 study abroad grant. Other scholarships and grants are available to assist with expenses. Completed eight preadmission courses with a grade of C or higher and must obtain a 2.25 cumulative GPA, and a 2.25 in these specific courses, before admission to the degree program. These courses are recommended for completion during your freshman and sophomore years. Demonstrate proficiency in a single modern foreign language through the level of Intermediate II. To satisfy the General Education Assessment Policy, students must take the GEA exam before or during the semester in which a total of 45 credit hours will be earned. The minimum score of 425 must be achieved by the semester in which 75 credit hours will be earned. For more information, visit ucmo.edu/testingservices.